In its final, and most consequential, game of the regular season, the Boston University men’s lacrosse team defeated the College of the Holy Cross 9-4 to clinch a spot in the 2018 Patriot League Tournament. 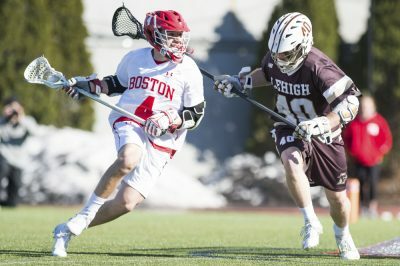 Coming off a tough 23-9 loss to Loyola University Maryland last weekend, BU (7-7, 3-5 Patriot League) was in need of a victory in order to secure a playoff spot. With the Crusaders (4-9, 2-6 Patriot League) in the same spot, the Terriers sealed the regular season with a strong performance. The Terriers scored the game’s first seven goals, only allowing the Crusaders to score once in the first half, and Polley said he was very pleased with his team’s strong start. The team’s early 7-0 lead was especially promising after several games with slow starts. Freshman attack Chris Gray led the offense, scoring three of the Terriers’ first five goals, and assisting on another. All season Gray’s dominance has been on full display, and Polley noted the importance of the freshman’s playmaking. The rookie attack leads the Terriers with 59 points in 2018, including a team-best 34 assists. He ended the regular season tied for second in goals with 25. What’s the secret to his success? 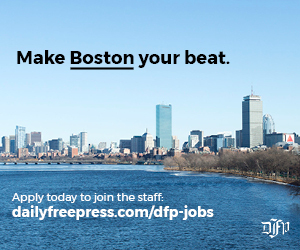 It’s simple, according to Polley. Polley has high expectations for Gray, and hopes his young star will be rewarded with accolades, namely Rookie of the Year and being named to the First Team All-Conference. “He is a special player, and I think he’s going to rewrite the BU record book,” Polley said. In addition to Gray, Terrier sophomore goalkeeper Joe McSorley performed well between the pipes on Friday, allowing a season-low four goals, equalling the mark he set on February 20 against Dartmouth. McSorley ended the contest with 10 saves, and was awarded the Turnpike Trophy MVP. The Terriers entered the third quarter with a commanding 7-1 lead. The scoring barrage continued, with junior attack James Burr and senior midfielder Greg Farris each netting a goal on man-up opportunities to bring the score to 9-1. The Crusaders would go on to score the final three goals of the matchup, with two from senior attack Logan LeBlond in the third and one from sophomore attack Kevin Kodzis in the fourth. With the victory, the Terriers will enter their second-ever postseason tournament berth as the No. 6 seed and will play No. 3 seed Bucknell University Tuesday night. After ending the season with a big win, Polley said BU is in good spirits.